Philosophy for busy people. Listen to a succinct account of the philosophy of Schopenhauer in just one hour. Arthur Schopenhauer, the 'philosopher of pessimism,' makes it clear that he regards the world and our life in it as a bad joke. However, if the world is indifferent to our fate it doesn't thwart us deliberately - its façade is supported by what Schopenhauer calls the universal Will. He saw this as a force that is blind and without purpose, bringing on all our misery and suffering. Schopenhauer taught that our only hope is to liberate ourselves from the terrible power of the Will and from the trappings of individualism and egoism that are at its mercy. 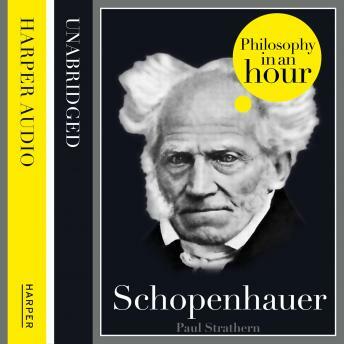 This audiobook is an expert account of Schopenhauer's life and philosophical ideas - entertainingly written and above all easy listening. Also included are selections from Schopenhauer's work, suggested further reading, and chronologies that place Schopenhauer in the context of the broader scheme of philosophy.